Weddings and wedding receptions can be the occasion of great happiness but also of social embarrassment. I remember going to a friend’s wedding many years ago. The service itself was in a beautiful old church. Afterwards, we went on to the reception at the bride’s parents’, a large and rambling house with a stream running through its extensive grounds. We gathered on the lawns and ultimately in a large marquee. Some drinks and canapés were distributed. As the customary wedding speeches ended, we expected something more substantial to eat and drink but the refreshments had run out. The guests were rather disgruntled but too polite to show it. I remember leaving the wedding with an absolute craving for food – any food. Without trivializing it, the Sunday’s Gospel, the story of the Wedding at Cana – the wedding that Jesus attended where the wine ran out – hinges on an occasion of great social embarrassment. In Jesus’ time, many families would not have drunk wine regularly but they were expected to provide a supply that would last supply for the week-long festivities that attended a wedding. Weddings provided a welcome break from everyday labour and the meagre rations of daily life. To run out of wine was a major social gaffe. People accepted that less expensive wine would be served as the week wore on but running out would be a social disaster. Anyone listening to this story in the first century would have recognized this. The author of John’s gospel, having caught his audience’s attention, uses the story to reveal who Jesus is and prepare us for what will follow. This and the next story in the gospel, the cleansing of the Temple, happen “on the third day”, and so gesture towards Jesus’ death and resurrection. This point is reinforced by Jesus’ response to his mother, “My hour has not yet come”, a phrase repeated on successive occasions and building up to the moment when he faces his death and says, “My hour has now come”. Mary uses words that echo Pharaoh’s words to his servants when Joseph takes charge during the famine in Egypt: “Do whatever he tells you”. Just as Pharaoh trusted that Joseph could find ways of feeding his people, Mary trusts that Jesus will do something to remedy the shortage of wine. Jesus tells the servants to fill the jars that were at the entrance to the house to enable people to perform their purification ritual. This would have puzzled the servants as the jars were only meant to contain water. Also, we forget that this process would have been time-consuming, as all the water had to be drawn from a well. Once the jars are full Jesus tells them to draw a sample of the liquid and take it to the steward of the feast, who is surprised to discover that he is tasting wine better than wine than they had had earlier. This was the opposite of normal practice – you normally kept the inferior wine until later, since by then people wouldn’t be sober enough to notice the difference. There is elaborate symbolism in Jesus’ actions, which is why these events are described as signs. Jesus has taken water jars used for ritual purification, an essential part of Jewish life, and transformed their contents. He has done something that supersedes existing custom: the implication is that the traditional way of being cleansed no longer matters. This sign also points us to a revelation of the character and nature of God. Here, at the very beginning of his public life, when the disciples have only just begun to gather around him, Jesus reveals a sign of the abundance and extravagance of God’s grace. 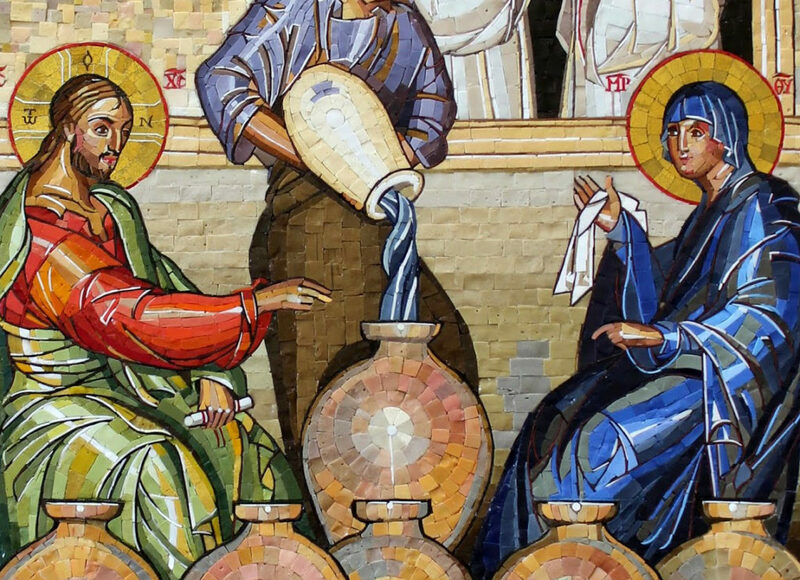 Jesus turns the water into an enormous amount of wine and into wine of the highest quality. Each jar yielded twenty to thirty gallons of wine (80 to 100 litres), at least the equivalent of at least 100 bottles of wine. This was a revelation, an epiphany, for the disciples. It also continues with the creation theme of the Prologue to John’s Gospel. The Prologue evokes the first creation story in chapter one of Genesis, by using the phrase ‘In the beginning’. The transformation of water into wine is a new creation.